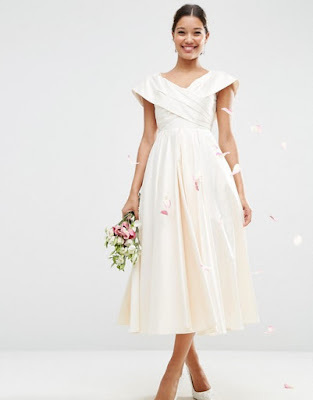 If you are looking for a beautiful budget wedding dress this season then how about this offering for ASOS? They have a gorgeous collection of purse friendly wedding dresses that still deliver on the pretty stakes. This is one of my favourites from their collection. The cross front neckline and pleated design add a real feel of retro class to this dress. A full mesh lines skirt finishes off this simple yet chic look. Pair this dress with some stunning red peep-toe platforms for a real "WOW" factor wedding look. 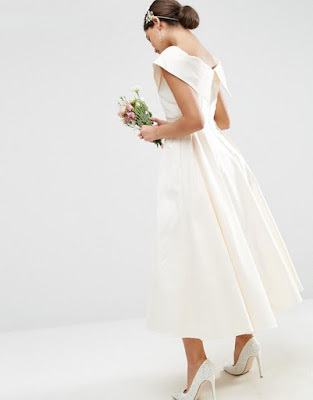 To see more of the fabulous wedding dress collection from ASOS visit their website here.